For complete details on ordering a cake at Walt Disney World CLICK HERE. Custom celebration cakes are no longer available for delivery inside Magic Kingdom. Instead, your options are the Mickey Mouse Celebration Dome Cake or one of the following specialty desserts unique to each table-service location. Note: Each dessert is exclusive to one restaurant and cannot be ordered at another dining location. Three mini cupcakes: a Grey Stuff cupcake, a Triple Chocolate cupcake, and a Strawberry cupcake. Presented with a chocolate rose filled with the Grey Stuff filling and a “Happy Birthday,” “Happy Anniversary,” or “Congratulations” chocolate piece. Chocolate cake with chocolate mousse, covered with a chocolate ganache. 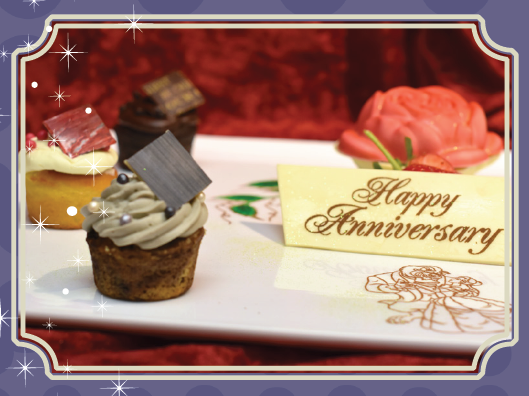 Presented with a strawberry and your choice of a dark chocolate slipper, a white chocolate slipper, or a white chocolate crown, all filled with a chocolate mousse and decorated with a “Happy Birthday,” “Happy Anniversary,” or “Congratulations” chocolate piece. Chocolate cake with caramel ganache and chocolate crispy pearls. 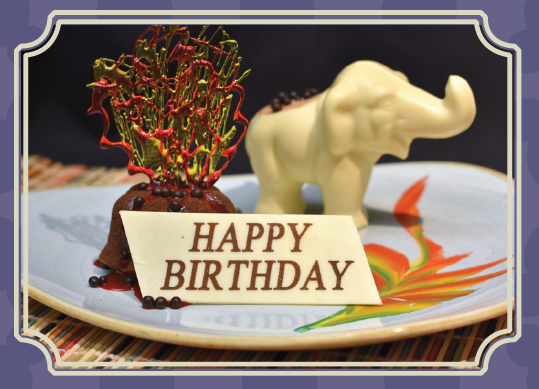 Presented with a white chocolate elephant filled with a caramel mousse and a “Happy Birthday,” “Happy Anniversary,” or “Congratulations” chocolate piece. Vanilla cake with vanilla cream filling, covered in a chocolate ganache and chocolate crispy pearls. 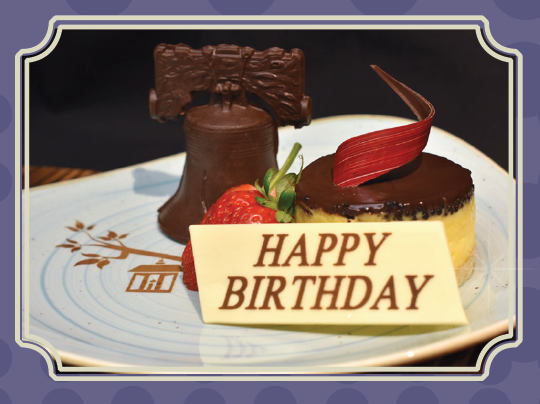 Presented with a strawberry, a chocolate Liberty Bell, and a “Happy Birthday,” “Happy Anniversary,” or “Congratulations” chocolate piece. Kahlua Espresso-soaked ladyfingers with whipped mascarpone cheese. 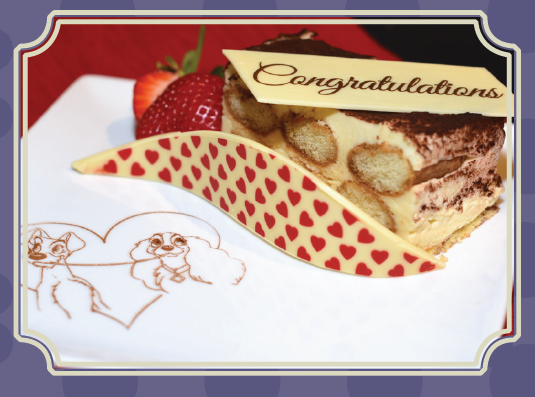 Presented with a strawberry, Lady and the Tramp chocolate accents and a “Happy Birthday,” “Happy Anniversary,” or “Congratulations” chocolate piece. Available in either all-vanilla or all-chocolate. Only choices for chocolate sign are “Happy Birthday” or “Congratulations.” Serves up to 6 people and costs $35 plus tax. Limited quantities available at the check-in podium, or call ahead. To place an order, contact WDW.Magic.Kingdom.Specialty.Desserts@Disney.com with your dining confirmation number and your order details at least 72 hours prior to your reservation. You will receive a confirmation email once your order has been placed. Payment for any add-ons is not due until you dine. No prepayment or third-party payment. Office hours: Monday-Saturday 8:00am-4:00pm (ET); allow up to 72 hours for a response.